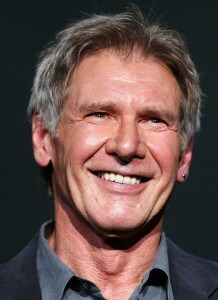 Harrison Ford (born July 13, 1942) is an American film actor and producer. He is famous for his performances as Han Solo in the original Star Wars trilogy and the title character of the Indiana Jones film series. Ford is also known for his roles as Rick Deckard in Blade Runner, John Book in Witness and Jack Ryan in Patriot Games and Clear and Present Danger. His career has spanned six decades and includes roles in several Hollywood blockbusters, including Apocalypse Now, Presumed Innocent, The Fugitive, Air Force One, and What Lies Beneath. At one point, four of the top six box-office hits of all time included one of his roles. Five of his films have been inducted into the National Film Registry. In 1997, Ford was ranked No. 1 in Empire’s “The Top 100 Movie Stars of All Time” list. As of July 2008, the United States domestic box office grosses of Ford’s films total over US$3.5 billion, with worldwide grosses surpassing $6 billion, making Ford the third highest grossing U.S. domestic box-office star. Ford is the husband of actress Calista Flockhart. Daniel Wymbs: Most are excellent. Ferdia McAnna (writer): Harrison Ford is a grumpy bollix but he’s the best action hero ever. Michael Doherty (RTE Guide): A solid action lead in his day, but never a dramatic force. Elfrieda Carroll: Wooden acting but love him. Alvean Jones (tv presenter): Cheesy at times, but understated in other roles. Liked him in Indiana Jones. Film fan: a reasonably impressive CV, but never really carved out a distinct niche as a performer.